By Keith Cowing on February 25, 2011 2:56 PM. "This photo was taken from an an altitude of over 70,000 feet (still being determined exactly) at 5:20 pm EST on 24 February 2011. 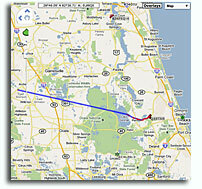 The camera used was the lowest resolution camera on board the Robonaut-1 balloon - a Motorola Droid X smartphone. You can see the plume left by Space Shuttle Discovery as it headed into space. We will be releasing more images of greater resolution and HD video very soon - all of which show Discovery heading into space. Photo credit (mandatory) Quest for Space/Challenger Center." Keith's update: We've added a video still taken by a GoPro Hero Motorsport that clearly shows Discovery arcing into orbit. The video (we'll post it soon) clearly shows the Discovery climbing into space. By Keith Cowing on February 25, 2011 9:14 AM. "The main focus of the day will be the six-hour inspection of Discoverys wing leading edges and nose cap. Commander Steve Lindsey, Pilot Eric Boe and Mission Specialist Alvin Drew will use the shuttles robotic arm and specialized cameras to downlink the detailed views of the thermal protection system for analysis by specialists on the ground." "Commander Steve Lindsey, Pilot Eric Boe and Mission Specialists Alvin Drew, Steve Bowen, Michael Barratt and Nicole Stott are scheduled to rendezvous and dock with the station on Saturday. During Discovery's seven days at the station, Bowen and Drew will do two spacewalks to do maintenance work and install new components." 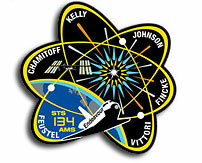 Continue reading STS-133 Operating On Orbit. By Marc Boucher on February 23, 2011 5:03 PM. We asked and you answered. The question was do you like NASA's new vision statement? "To reach for new heights and reveal the unknown so that what we do and learn will benefit all humankind." Of the 649 respondents, overwhelmingly 74% of our readers answered no, you don't like NASA's new vision statement. The question is why? Let us and NASA know, your comments are welcome. 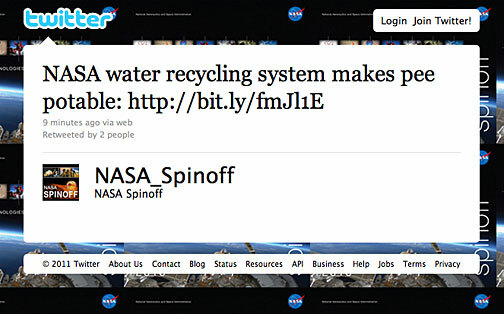 "A seemingly trivial event has revealed some schadenfreude about NASA, along with a lot of irritation. Apparently (as is their wont) the fertile minds running our national space agency decided that the time has come (once again) for a new and improved vision statement - out with the old and in with something new. These would be harmless exercises except to the extent that taxpayer money is being spent to no real purpose (but if I got into that, there'd be no end to this post)." By Keith Cowing on February 23, 2011 12:08 PM. "The launch of NASA's Glory spacecraft from Vandenberg Air Force Base in California is currently planned for no earlier than Friday, Feb. 25 at 5:09 a.m. EST. Engineers from NASA and Orbital Sciences Corp. continue to troubleshoot a technical issue that arose during Wednesday's initial launch attempt. 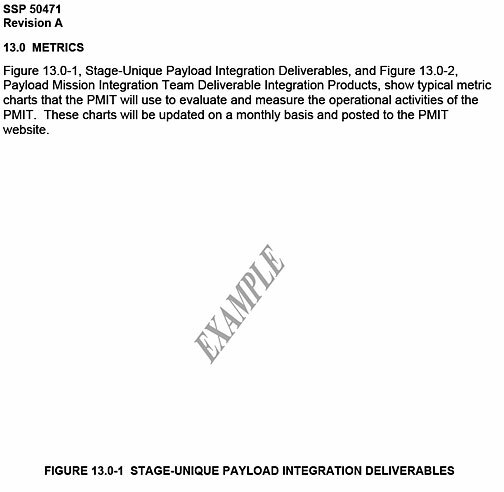 The target launch date also will ensure personnel get the required rest before entering another countdown." By Keith Cowing on February 23, 2011 9:55 AM. - A budget (seriously another three months on last year's budget). It is disappointing that the congress cannot fulfill its duties in a timely fashion. - An inspiring vision. I just can't get excited about visiting a NEO. Up until a couple of months ago, I had never heard of one. I know what the moon is and I know what Mars is but a NEO? Seriously? - A serious challenge. Am I back talking about a NEO again, I'll try to move on. - Some hard decisions. As long as we continue to make everyone feel good about what NASA is doing for them, we will never do anything bold again. We need some bold leadership in the agency, in the executive office and in the congress. Is this too much to ask? - Engagement with the international community. NASA arrogance is keeping us from partnering with foreign entities in all but political arrangements. We always have to be king and others (China, etc...) are asking who do you think you are? - ULA and Charlie Brown's football. They hung it out in front of us just to make us salivate and than quickly took it back when the political pressure warmed up - gutless reaction. This is micromanagement at its worst." ... Plus some cogent comments on NASA IT. By Keith Cowing on February 22, 2011 9:20 PM. "A citizen science project running for over 100 years reached a key milestone this month when an amateur astronomer contributed the 20 millionth observation of a variable star on February 19, 2011. A variable star changes in brightness over time. Records of these changes can be used to uncover the astrophysical processes within evolving star systems. With a database going back over a century, variable star astronomers have access to a data source unparalleled in astronomy." By Marc Boucher on February 22, 2011 10:06 AM. 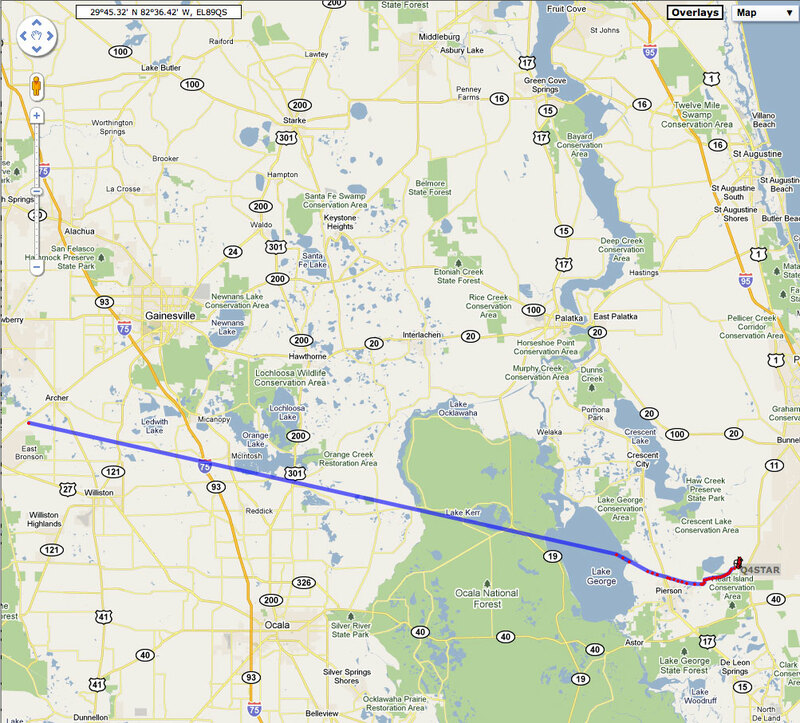 "NASA is poised to launch space shuttle Discovery on her last mission this Thursday at 4:50 p.m. EST. It seems with all recent attempts to get Discovery launched, NASA is working one minor leak issue. However the issue should not cause any delay." By Keith Cowing on February 21, 2011 9:30 AM. "While some of the coverage of the massive Valentine's Day solar flare made it sound like the world was coming to an end, or darn close to it. NASA's website this afternoon played another likely more realistic tune: "The particle cloud produced by the Valentine's Day event appears to be rather weak and is not expected to produce any strong effects at Earth other than perhaps some beautiful aurora in the high northern and southern latitudes on Feb. 17." "The sun is waking up from a long quiet spell. Last week it sent out the strongest flare for four years - and scientists are warning that earth should prepare for an intense electromagnetic storm that, in the worst case, could be a "global Katrina" costing the world economy $2,000bn. Senior officials responsible for policy on solar storms - also known as space weather - in the US, UK and Sweden urged more preparedness at the annual meeting of the American Association for the Advancement of Science in Washington." By Keith Cowing on February 20, 2011 3:35 PM. "National Aeronautics & Space Administration (Nasa) is trying hard prevent India's first manned space mission, tagged at Rs10,000 crore,from being indigenous. And India does not seem to have a problem. ...DNA has learnt that US' desperation emanates from pressure from within their country to restart its manned space mission, which it suspended in 1972 citing huge costs. This follows a review of Nasa's manned space programme conducted by a 10-member US presidential panel. An Isro scientist told DNA collaboration on India's manned space mission will benefit India and US. 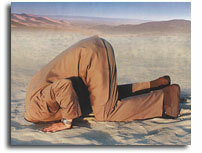 "Nasa is struggling for a higher budget to conduct human space exploration," he said." By Keith Cowing on February 19, 2011 12:16 PM. "This remarkable photo was taken by ESA astronaut Paolo Nespoli from the ISS on 16 February 2011, just minutes after ATV Johannes Kepler lifted off on board an Ariane 5 from Kourou at 22:50 UTC. It shows the rising exhaust trail of Ariane, still in its initial vertical trajectory. The trail can be seen as a thin streak framed just beneath the Station's remote manipulator arm. Credits: ESA/ NASA"
By Keith Cowing on February 18, 2011 1:02 PM. "Comprised of 34 WAC image positions with NAC insets, the majority of this mosaic was obtained on 3 November 2010. However, due to pointing constraints on the spacecraft, the portion of the mosaic near and covering Neptune was acquired a few weeks later on 16 November 2010. All of the planets are visible except for Uranus and Neptune, which at distances of 3.0 and 4.4 billion kilometers were too faint to detect with even the longest camera exposure time of 10 seconds, though their positions are indicated. (The dwarf-planet Pluto, smaller and farther away, would have been even more difficult to observe). 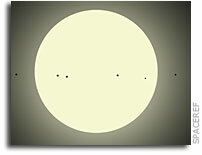 Earth's Moon and Jupiter's Galilean satellites (Callisto, Ganymede, Europa, and Io) can be seen in the NAC image insets." By Keith Cowing on February 18, 2011 12:30 PM. "NASA will launch a University of Colorado experiment to image the sun on a NASA suborbital sounding rocket February 23, from the White Sands Missile Range, N.M. The Extreme Ultraviolet Variability Experiment (EVE) will support measurements by NASA's Solar Dynamics Observatory (SDO) satellite. ... NASA's Sounding Rocket Program is managed at the agency's Wallops Flight Facility in Virginia." Keith's note: If you go to the NASA White Sands website, no mention of this launch is made. And there is nothing at the Missile Range website either. Wallops issued this press release, is listed as managing this launch as part of the NASA Sounding Rocket Program, and the NASA PAO contact listed is at Wallops. However, no mention is made of this launch on the Wallops home page, but there is an item listed under "upcoming launches" -- but it is for a flight on 22 January - a month ago. No mention is made at the Code 810 website listed in the press release. The link to the "schedule" page at Wallops gets you this message: "The Wallops Daily Range Schedule is no longer available for public use. Thank you for your patience as the Wallops Flight Facility Public Affairs Office works to create a public schedule, available on the Wallops home page." By Keith Cowing on February 18, 2011 9:27 AM. "Shipman was 29 when she met astronaut Bill Oefelein at an Orlando, Fla., house party. Little did she know that the 2006 encounter would do more than just begin an other-worldly relationship. It also would kick-start a chain of events that would land her in the middle of a bizarre astronaut love triangle. For the first time, she is sharing her story of the events with "20/20." By Keith Cowing on February 18, 2011 8:03 AM. "The Obama administration asked Congress for $14 million to transfer the space shuttle Atlantis to the Air Force Museum here, a strong sign the Dayton region may land one of three orbiters when they are retired this summer. Although NASA Administrator Charles Bolden will make the final decision on where to locate Atlantis, the request -- tucked deep inside the administration's 2012 budget -- suggests that the White House and the Air Force favor the National Museum of the U.S. Air Force as a final destination for Atlantis." "The Boeing Company announced today that it will donate $5 million to the Air Force Museum Foundation in three installments over the next three years. The foundation will deliver the funds to the U.S. Air Force for the benefit of the National Museum of the U.S. Air Force at Wright-Patterson Air Force Base near Dayton, Ohio." By Keith Cowing on February 17, 2011 10:29 PM. "NASA's Hubble Space Telescope reveals a majestic disk of stars and dust lanes in this view of the spiral galaxy NGC 2841. A bright cusp of starlight marks the galaxy's center. Spiraling outward are dust lanes that are silhouetted against the population of whitish middle-aged stars. Much younger blue stars trace the spiral arms." By Keith Cowing on February 17, 2011 10:15 PM. "The FY12 budget request for NASA is $18.7 billion, the same amount requested in FY10. Congress fully funded the agency's request in the FY10 appropriations bill, a level which has continued to this day. For the four-year runout (FY13 - FY16), NASA's budget projection assumes identical funding for each year - $18.7 billion. However, the Office of Management and Budget (OMB) Blue Book and NASA's own budget request disagree on out-year funding levels; NASA's assumes four years of flat funding at $18.7 billion; OMB's out-year projections indicate budgets that are below the FY12 request." "While it is true that prudent investments in science and technology will almost certainly yield future economic gains and will allow our knowledge economy to grow, it is also true that these gains can be thwarted by poor decision-making," Chairman Hall said. "Americans expect and deserve better. With our unemployment hovering at over 9 percent, they expect us to reduce or eliminate those programs that are duplicative and wasteful and examine ways to advance real job creation and economic growth, not just spend their hard-earned money on what the government assumes is best for them." "We can disagree over some of the specific choices in this budget proposal," said Congresswoman Johnson, "but I share with the president the same goal of maintaining a strong national science and technology enterprise and ensuring that all of our young people are prepared for the technical careers of the future." 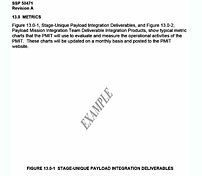 Department of Defense Science and Technology Programs (6.1, 6.2, 6.3): -8.0 percent"
By Marc Boucher on February 17, 2011 9:35 AM. "Huntsville attorney Mark McDaniel, who has advised presidents, NASA administrators and Congress on space policy, says a fight for NASA's future is about to lift off. "What's gearing up right now is a space policy fight again, just like we had last year," he predicted." McDaniel says it's irritating for NASA employees to keep changing directions. "It can be frustrating when they have this policy, then you have another policy, and then you have another policy,"
By Keith Cowing on February 16, 2011 9:48 PM. "This clip of the large X2 flare (Feb. 15, 2011) seen by Solar Dynamics Observatory (SDO) in extreme ultraviolet light has been enlarged and superimposed on SOHO's C2 coronagraph for the same period. This was the largest flare in over four years. The coronagraph shows the faint edge of a "halo" coronal mass ejection (CME) as it races away from the Sun and was heading towards Earth. Scientists predict that this CME is likely to catch up with ones from the 13th and 14th, and the whole mass of particles should reach Earth late Thursday or early Friday (UT). They may put on an excellent show of aurora. In the coronagraph the Sun is blocked out by an occulting disk so that the fainter features of the corona are visible. By adding in the SDO video clip, we get the best of both worlds. The video covers about 11 hours." By Keith Cowing on February 16, 2011 4:15 PM. Page 203, line 23, after the dollar amount, insert "(increased by $298,000,00)". Page 204 line 8, after the first dollar amount Insert "(increased by $298,000 00)' . Page 206, line 10, after the dollar amount, insert ''(reduced by $298,000 000) '. By Keith Cowing on February 16, 2011 2:26 PM. "The National Aeronautics and Space Administration (NASA) plans to invest billions of dollars in the coming years to explore space, understand Earth's environment, and conduct aeronautics research. GAO has designated NASA's acquisition management as high risk in view of persistent cost growth and schedule slippage in the majority of its major projects. GAO's work has focused on identifying a number of causal factors, including antiquated financial management systems, poor cost major systems." By Keith Cowing on February 16, 2011 9:05 AM. "Explorer 9 was the first spacecraft placed in orbit by an all-solid rocket and the first spacecraft successfully launched from Wallops Island. It was launched on 16 February 1961. 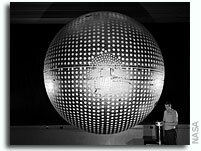 Explorer 9 was the first in a series of 3.66 m inflatable spheres to be successfully placed into orbit solely for the determination of atmospheric densities. It was identical in its objectives and configuration to the earlier unsuccessful launch of Explorer S-56." Keith's 15 Feb note: Thanks to a tip by @NASAHistory. Too bad Wallops PAO is not aware of this anniversary. By Keith Cowing on February 15, 2011 8:00 PM. "The data indicate Stardust went through something similar to a B-17 bomber flying through flak in World War II," said Don Brownlee, Stardust-NExT co-investigator from the University of Washington in Seattle. 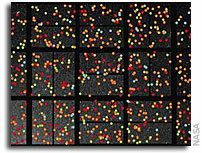 "Instead of having a little stream of uniform particles coming out, they apparently came out in chunks and crumbled." Keith's note: The title of this press release, as issued by NASA, was "NASA Releases Images Of Man-Made Crater On Comet". I changed the title on my websites. "Man-made"? So much for the women who participated in this flyby - on Valentine's Day (in case you missed NASA's relentless romantic-themed hype of this flyby). By Keith Cowing on February 15, 2011 3:03 PM. "Mission controllers at NASA's Jet Propulsion Laboratory, Pasadena, Calif., have begun receiving the first of 72 anticipated images of comet Tempel 1 taken by NASA's Stardust spacecraft." "NASA has rescheduled a news conference covering images and early data from last night's Stardust-NExT comet flyby for today at 12:30 p.m. PST (3:30 p.m. EST). The news conference was originally scheduled for 10 a.m. PST (1 p.m. EST). The additional time will allow scientists to process and analyze data and images gathered when the spacecraft flew past Comet Tempel 1, with closest approach at a distance of 181 kilometers (112 miles). 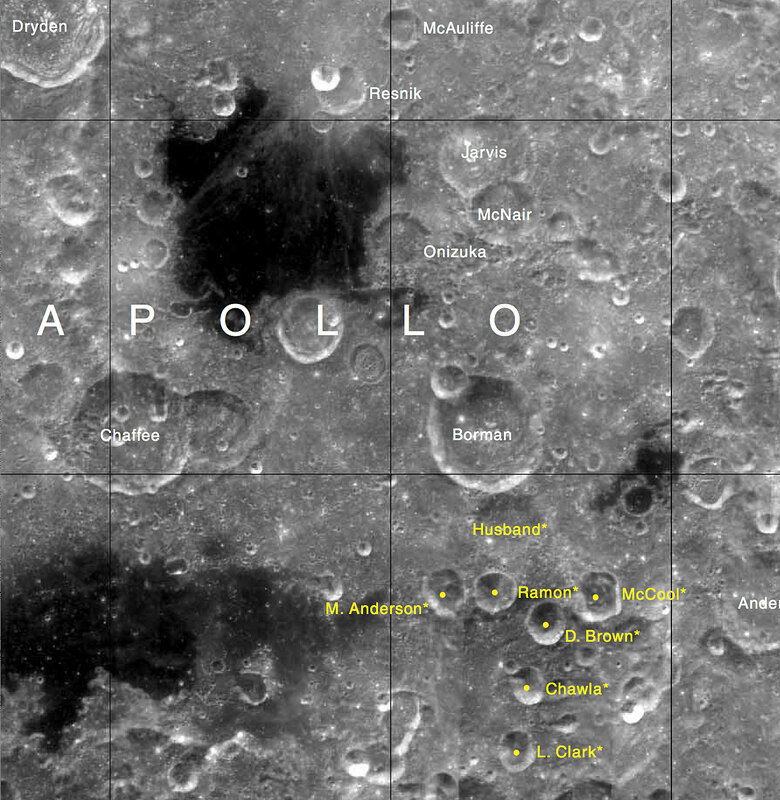 The mission team had expected the closest-approach images to be sent first. Instead, the images were downlinked in chronological order, starting with the most distant approach views." By Keith Cowing on February 15, 2011 2:20 PM. "You are invited to join Administrator Charlie Bolden and Deputy Administrator Lori Garver for a special NASA Update on Tuesday, February 15, at 2:00 pm EST. During the event, the administrator and deputy administrator will discuss the agency's fiscal year 2012 budget request. The program will be broadcast from the Headquarters auditorium and carried live on internal television at Headquarters and the NASA centers. During the NASA Update, employees will be able to ask questions from Headquarters and participating NASA centers, or you can send e-mail questions to nasaupdate@hq.nasa.gov"
Reader note: "Who is talking to whom. The NASA budget update video presentation to NASA employees which was to be presented at 2 pm this afternoon was postponed until 3pm due to a fire drill at NASA HQ. You would think that this fire drill might have taken place at a different time of day or another day so as not to interfere with this much advertised live video event. If the right hand doesn't talk to the left hand, cut one off." Keith's 16 Feb update: I am told that this was a "real" fire drill. I am still waiting for someone at NASA to give me an official explanation since I get nothing but "fire drill" notes from people at HQ and around the agency. By Keith Cowing on February 15, 2011 10:32 AM. "The past 7 years of my career have been focused on designing, developing, implementing, and stabilizing the NSSC, and I have never worked with a more talented, dedicated group of individuals than the NSSC team." "...the OIG found that NASA's claim that creation of the NSSC would save the Agency $121 million over a 10-year period (fiscal years 2006 through 2015) was based on flawed data and is therefore inaccurate. Our analysis determined that cost data supplied by the Centers, which was essential in determining the baseline cost calculations and return-on-investment projections, were not reliable or verifiable." By Keith Cowing on February 14, 2011 4:27 PM. "President Barack Obama on Monday proposed reining in expenses at NASA, sending his 2012 budget blueprint to Congress calling for a five-year freeze on new spending at the US space agency. The president would restrict NASA's budget to last year's levels, $18.7 billion annually through fiscal 2016. The figure represents a 1.6-percent decrease from the spending total the agency had sought for fiscal 2011, which ends in September. "This budget reflects the overall fiscal reality of the US government. There is not a lot of money available," said John Logsdon, a former director of the Space Policy Institute in Washington." "President Obama's proposed budget also makes explicit that the agency is focusing its longer-range planning on traveling to an asteroid, rather than to the moon. It adds funds as well to make use of the International Space Station more available to scientists and their institutions. The $100 billion space station, which has been formally designated as a national laboratory, would be funded through 2020 under the Obama budget. Earlier budgets during the Bush administration gave it funding only through 2015." "President Barack Obama today released a $18.7-billion budget proposal for NASA that's almost certain to reignite last year's heated battle over the role that commercial companies should play in blasting astronauts into space. Obama's plan would spend $850 million in 2012 to help commercial companies, like SpaceX of California, meet a White House goal of using non-government spacecraft to ferry astronauts to the International Space Station by 2016. That's $350 million more than what Congress outlined in a heavily-debated NASA policy plan signed into law last year. And Obama would also cut nearly $1 billion from the new heavy-lift rocket that Congress ordered NASA to build by the end of 2016." By Keith Cowing on February 14, 2011 3:45 PM. "- Provides $18.7 billion, the same amount the agency received in 2010. Funding focuses on areas that will improve the Nation's space capabilities, strengthen our competitive edge, and prepare the next generation of leaders in the field. The Budget also proposes to streamline operations and boost efficiencies at facilities "
"The NASA budget and supporting information will be available online at 1 p.m., Feb. 14, at: http://www.nasa.gov/budget"
Keith's 1:10 pm update: NASA PAO has changed their mind from what they said last week in this press release. The budget information will not be online at http://www.nasa.gov/budget until 1:30 pm ET according to a new release they just issued. PAO also held an embargoed media briefing on the budget last week. They told me and several other reporters that we could only bring a "pencil and paper - no cellphones, laptops etc." I ended up not going. I found out later that other media who attended were allowed to bring in laptops, etc. Also, the way they have today's briefing set up if you physically attend the event at NASA HQ you will have to miss one or more of the topic-oriented budget teleconferences (telecon only) briefings that start 30 minutes later (you can't physically attend them). So, unless your office is nearby - or you can find a quiet place with your cellphone - for 3 1/2 hours, you are going to miss things. Keith's 3:45 pm update: Now I hear reporters participating from a NASA HQ location in the Space Operations telecon. Gee, no one at PAO told me that this was an option. By Keith Cowing on February 14, 2011 1:57 PM. "To reach for new heights and reveal the unknown so that what we do and learn will benefit all humankind"
"To reach for new heights and reveal the unknown to benefit all humankind"
By Keith Cowing on February 13, 2011 7:27 PM. "None of the funds made available by this division may be used for the National Aeronautics and Space Administration or the Office of Science and Technology Policy to develop, design, plan, promulgate, implement, or execute a policy, program, order, or contract of any kind to participate, collaborate, or coordinate in any way with China or any Chinese-owned company unless such activities are specifically authorized by a law enacted after the date of enactment of this division," the bill's drafters wrote." By Keith Cowing on February 12, 2011 10:54 AM. "The Committee will continue to provide oversight of NASA's human spaceflight program as it undergoes a period of uncertainty and transition following various Administration proposals. Specific attention will be paid to the feasibility of NASA's plans and priorities relative to their resources and requirements." "[Rep. Ralph] Hall, one of NASA's most vocal supporters in Congress, said the committee would have to work together to support the agency amid tight budgeting that will force cuts throughout the government. "My goal is to keep our position in space, keep our leadership in space and keep our national and international partners," Hall said. "I'm not urging anybody to go to Mars right now or back to the moon, or any place when people can't go to the grocery store. The economy has to be good. But we've got to continue to work toward it and plan for it." By Keith Cowing on February 11, 2011 1:08 PM. "At the present time, NASA finds itself in a state of significant uncertainty, particularly with respect to its human space program. The final Space Shuttle flights are scheduled for later this fiscal year and construction of the International Space Station is essentially complete; however, the Agency has not achieved significant momentum on space exploration directives contained in 2010 authorizing legislation because of funding and technical questions. The most immediate challenge facing NASA's leadership is to manage the Agency's portfolio of space and science missions amid the continuing lack of clarity caused by conflicting legislative directives in the Authorization Act and a holdover provision in NASA's fiscal year (FY) 2010 appropriations law. The latter provision prevents NASA from terminating any aspect of the Constellation Program or from initiating any new program." By Keith Cowing on February 11, 2011 11:47 AM. Convicted moon rock thief Thad Roberts: "(We) came out with a 600-pound safe, (estimated by the government to be worth $7 million to $21 million) sawed it open in a hotel room and sorted all the moon rocks, which included a meteorite from Mars," Roberts said. "I definitely knew at this point that I had the best rock collection in the world." Within a week, rumors spread, inevitably revealing Roberts' and the women's guilt. This resulted in an eight-year sentence for him, and only house arrest for the two women because he took the "leadership position" in the crime." Keith's note: So Thad - you aren't at all sorry that you stole and damaged these invaluable research specimens? The author of this article doesn't seem to be interested in this obvious aspect of the story - indeed she writes: "In such a short time, Roberts has lived an unimaginable life, but he is continuing to complete his goals and hopes to see success in his future." By Keith Cowing on February 11, 2011 8:18 AM. "This is the least we could provide to Egyptian youth and revolutionaries. This step represents transferring the dreams of Egyptian youth from a small stretch of earth to the enormous expanse of space," said Haji to Al-Mary Al-Youm." "The United States' space agency, NASA, has okayed naming one of its spaceships after Sally Zahran, a young Egyptian woman killed during the first few days of anti-government demonstrations in Egypt. Essam Mohamed Haji, a researcher at NASA, told the Egyptian independent daily Al-Masry Al-Youm he had received approval to put the young woman's name on a spaceship heading for Mars." "The paper quoted Essam Mohamed Haji, a young researcher at NASA, as saying Thursday that he had received approval to put the young woman Sally Zahran's name on a spaceship heading for Mars." Keith's note: I am assuming that this is not true - but it does speak to what people think of NASA around the world - i.e. that being associated with it - and its missions - is something special. By Marc Boucher on February 10, 2011 4:54 PM. "NASA Administrator Charles Bolden will brief reporters about the agency's fiscal year 2012 budget at 2 p.m. EST on Monday, Feb. 14. 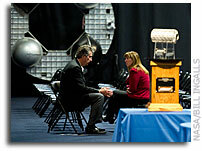 The news conference will take place in the James E. Webb Memorial Auditorium at NASA Headquarters, located at 300 E St. S.W., in Washington. Chief Financial Officer Elizabeth Robinson will join Bolden. The news conference will be broadcast live on NASA Television and the agency's web site. Questions will be taken from news media representatives at headquarters and NASA field centers." By Keith Cowing on February 10, 2011 1:00 PM. By Keith Cowing on February 10, 2011 7:09 AM. "House appropriations oversight season starts in earnest this week as subcommittees hold the first of "hundreds" of oversight hearings to trim funding for federal agencies and programs. On Wednesday, two of the 12 appropriations subcommittees are set to review budget numbers with key officials from the Justice Department, Commerce Department, NASA and Securities and Exchange Commission." By Keith Cowing on February 9, 2011 4:27 PM. "Officials with The Conrad Foundation today announced 27 high school teams will compete in the finals for the 2011 Spirit of Innovation Awards. The annual competition, presented by Lockheed Martin Corporation, challenges students to solve real-world problems by creating science and technology based products that can be introduced to the marketplace. This year's competition challenges students to develop new ideas in the areas of aerospace exploration, clean energy and cyber security. The finalist teams in each category include: ..."
By Keith Cowing on February 9, 2011 3:32 PM. "Here's where the math gets tricky. The cuts announced by the appropriations committee call for a $379 million reduction to NASA's budget. A sizable sum if true. But it's another example of what happens when politicians start doing math. Here's why. The $379 million doesn't use the 2010 budget as a baseline. It uses President Barack Obama's proposed 2011 budget as a baseline, which was gave $19 billion to NASA. But that budget never passed." "House Appropriations Chairman Hal Rogers today announced a partial list of 70 spending cuts that will be included in an upcoming Continuing Resolution (CR) bill. The CR legislation will fund the federal government for the seven months remaining in the fiscal year and prevent a government wide shut-down, while significantly reducing the massive increases in discretionary spending enacted in the last several years by a Democrat majority. A full list of program cuts will be released when the bill is formally introduced." By Keith Cowing on February 9, 2011 8:36 AM. "Existing language ( "Section 605" ) of the FAA reauthorization bill would have established an Advisory Committee on the Future of Aeronautics to, among other purposes, consider transferring the responsibility for civil aeronautics research and development--a key mission of NASA Glenn--from NASA to other existing departments or agencies of the federal government, to an academic consortia, or to a non-profit. Brown's amendment, which passed 96-1, stripped this language from the FAA bill and ensured that civil aeronautics research and development would remain a central mission at NASA." By Keith Cowing on February 8, 2011 3:05 PM. "We write today to assert the importance of maintaining our nation's human spaceflight program. Our constituents spoke loudly and clearly in the last election and sent a wave of new and reelected Members with a mandate to reduce federal spending. Moreover, each of us understands that our nation is on an untenable economic path and spending must be reduced. In getting our fiscal house in order, however, we must focus carefully on ensuring that we preserve critical capabilities and guarantee that agencies are focused on their primary mission. For NASA, that mission is human space exploration, and we ask that NASA funding be allocated in a way that refocuses NASA on this core mission." (1) The expansion of human knowledge of the Earth and of phenomena in the atmosphere and space; ... (3) The development and operation of vehicles capable of carrying instruments, equipment, supplies, and living organisms through space"
Note that the FIRST item in the act is studying the Earth, atmosphere, and related space phenomena (such as space weather). Human spaceflight is a subset of the THIRD item. Earth Science, broadly defined, is not a new or strange activity for NASA." By Keith Cowing on February 7, 2011 11:28 PM. "Based on this bipartisan vision, I strongly urge you to support the space program in your budget request for FY 2012. Any digression from the hard fought compromise would likely result in another year of turmoil for an already battered community. Thousands of highly skilled individuals have already lost their jobs, and additional job losses are expected as the agency transitions to the next generation space vehicle. Florida has been particularly hard hit with projected job losses over the next year and a half at more than 7000 - a state with an unemploynlent rate that already hovers near 12%. While many of these jobs are being lost with the Shuttle's retirement, we can reduce these job reductions by properly implementing the NASA Authorization Act." By Keith Cowing on February 7, 2011 5:22 PM. Keith's note: Text sent by someone@jpl: "NASA leaders will discuss the resurgence of techonology at NASA, collaborating with an international community, and the role of industry. Respectfully, attendance is limited to senior management level positions." Interesting. JPL hosts a "Town Hall Meeting" but apparently the town residents can't attend - only a few hand-picked civic leaders. Gee, how inclusive. By Keith Cowing on February 7, 2011 10:38 AM. Keith's note: According to this NASA JSC Mission Management Flight Request, this flight was charted for passengers to "attend and participate in the Constellation SFA Recognition Event activities". It took off with 11 people who went from JSC to GRC, dropped off 4, and the remaining 7 people flew from GRC to LaRC, had breakfast and then flew back to JSC. Those making the ESMD breakfast run: Dale Thomas, Charlie Stegemoeller, Mark Kirasich, Brenda Ward, Barbara Zelon, Stephanie Castillo, and Sonia Vasquez. Continue reading Constellation Breakfast Flight Update. By Keith Cowing on February 6, 2011 10:17 PM. "In executing the National Space Policy, our National Security Space Strategy seeks to maintain and enhance the national security benefits we derive from our activities and capabilities in space while addressing and shaping the strategic environment and strengthening the foundations of our enterprise. The U.S. defense and intelligence communities will continue to rely on space systems for military operations, intelligence collection, and related activities; access to these capabilities must be assured. We must address the growing challenges of the congested, contested, and competitive space environment while continuing our leadership in the space domain." By Keith Cowing on February 6, 2011 8:07 PM. White House Blog: Charles Bolden's Story: "From the Segregated South to Low Earth Orbit"
"It's a long way from the segregated south to low Earth orbit. But I am fortunate to have made the journey and to have had many opportunities to serve my nation in a 34-year career with the U.S. Marine Corps and in many roles at NASA, currently as head of the nation's space program. When I was a young man, my service as NASA's first African American Administrator under the Nation's first Black president would have been nearly unthinkable. But through the efforts of many people of all races, our nation has changed. And, thanks to the Space Shuttle Program, and NASA's cross-disciplinary exploration missions, African Americans and many others have had access to space and also to science and technological careers. The shuttle was really instrumental in breaking the color barrier for African Americans in space, and it all happened without a single law being passed." By Keith Cowing on February 6, 2011 11:13 AM. "Latest image of the far side of the Sun based on high resolution STEREO data, taken on February 6, 2011 at 23:56 UT when there was still a small gap between the STEREO Ahead and Behind data. 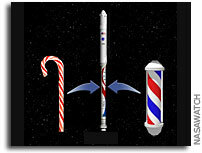 This gap will start to close on February 6, 2011, when the spacecraft achieve 180 degree separation, and will completely close over the next several days. Credit: NASA"
Why not wait until the image is complete in a week or so and then release it? Again, only Ed Weiler knows. Everyone else in his organization is scratching their head. According to the STEREO Facebook page "NASA will be holding a press conference concerning this event on February 9 at 2:00 PM US Eastern Standard Time." Ed won't be there though. Continue reading NASA SMD Deliberately Misleads The Public on STEREO. By Keith Cowing on February 4, 2011 11:25 AM. "Mark Kelly, husband of wounded Rep. Gabrielle Giffords, will fly the space shuttle Endeavour's final mission in April, according to a source familiar with the decision." "NASA astronaut Mark Kelly will resume training as commander of the STS-134 space shuttle mission on Monday, Feb. 7. With the exception of some proficiency training, Kelly has been on personal leave since Jan. 8 to care for his wife, congresswoman Gabrielle Giffords, who was critically wounded in a Tucson, Ariz. shooting." "NASA astronaut Mark Kelly, the husband of Rep. Gabrielle Giffords (D-Ariz.), seriously injured during the Tucson shooting rampage last month, also spoke briefly at the breakfast and gave the closing prayer." By Keith Cowing on February 4, 2011 11:20 AM. Leland D. Melvin, NASA Associate Administrator for Education: "As an astronaut, I have a deep connection to the honor and legacy that the Challenger Center for Space Education represents. A theme is evident in both the Challenger Center's mission and the President's Day of Remembrance remarks: triumph from tragedy. 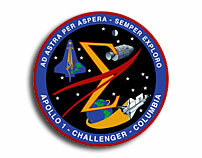 These words exemplify the resilience, purpose, and optimism that led to the creation of the Challenger Centers. The Challenger Centers and NASA also have similar values in terms of education, and these goals align with my own personal commitment." By Keith Cowing on February 3, 2011 8:40 PM. "Alabama's space museum is cutting more than 10 percent of its work force to reduce costs. The U.S. Space & Rocket Center in Huntsville is slashing its full-time payroll from 129 to 113 people at the end of this month. The new CEO of the state-owned attraction, Deborah Barnhart, announced the job cuts to managers on Thursday." "Irene Wilhite, longtime curator of the archives, and her assistant, her son Jamie, learned Thursday they are among 16 full-time Space Center employees being dropped from the payroll." By Keith Cowing on February 3, 2011 4:25 PM. "Stadd, 55, of Bethesda, Md., was convicted in federal court last August and sentenced in November for conspiring with Liam Sarsfield, then NASA's deputy engineer of programs, to steer money to his consulting firm and submitting false invoices. Sarsfield was separately convicted on a conflict of interest charge and sentenced last September to three years probation." By Keith Cowing on February 2, 2011 5:14 PM. Keith's note: Ellen Engelman Conners has been replaced as Director of External Relations at JSC. Connors got the civil service job back in 2008 through her political connections with the Bush Administration. Conners came to NASA willl no formal PAO experience and was previously employed at the FCC after declining to be reappointed to the NTSB. According to various news reports, her tenure at NTSB was somewhat contentious and uncomfortable - which is how people at NASA have described her tenure at JSC. Keith's note: Michael Kinkaid has been named Acting Director of JSC External Relations effective today. By Keith Cowing on February 2, 2011 1:00 PM. "A remarkable planetary system discovered by NASA's Kepler mission has six planets around a Sun-like star, including five small planets in tightly packed orbits. Astronomers at the University of California, Santa Cruz, and their coauthors analyzed the orbital dynamics of the system, determined the sizes and masses of the planets, and figured out their likely compositions -- all based on Kepler's measurements of the changing brightness of the host star (called Kepler-11) as the planets passed in front of it." By Keith Cowing on February 2, 2011 12:32 PM. "In the constellation of Ophiuchus, above the disk of our Milky Way Galaxy, there lurks a stellar corpse spinning 30 times per second -- an exotic star known as a radio pulsar. This object was unknown until it was discovered last week by three high school students. These students are part of the Pulsar Search Collaboratory (PSC) project, run by the National Radio Astronomy Observatory (NRAO) in Green Bank, WV, and West Virginia University (WVU)." By Keith Cowing on February 2, 2011 12:30 PM. "The Obama administration announced on Wednesday that it planned to regulate toxic substances in drinking water more strictly and would issue the first limits ever on perchlorate, a dangerous chemical found in rocket fuel that has seeped into groundwater in at least 400 locations." "According to NASA officials, the agency has detected perchlorate at four of the seven facilities where sampling occurred based on the historical use of perchlorate. NASA has undertaken a major perchlorate cleanup effort at one facility--the Jet Propulsion Laboratory in Pasadena, California, where NASA detected a groundwater plume that had contaminated local drinking water supplies." By Keith Cowing on February 2, 2011 10:25 AM. Keith's note: There were 73 characters left out of 140 available - so the author of this tweet could have chosen slightly more appropriate terms such as "waste", "urine", etc. Oh well. It certainly gets the mesaage across. Yes, its a slow news day thus far - until the Kepler announcement in a few hours. Of course, one of my favorite NASA PAO release titles - from 2003 is ''Fun With Urine' Pkg. TRT 1:49: "(Narration :09) UNOFFICIALLY CALLED 'MORE FUN WITH URINE,' THIS SHUTTLE EXPERIMENT COULD HELP FUTURE ASTRONAUTS FIGHT OFF DEPRESSION BY CREATING ART IN SPACE." By Keith Cowing on February 1, 2011 1:10 PM. By Keith Cowing on February 1, 2011 8:33 AM. "At the end of the event, Rona Ramon, Ilan's widow, spoke last. Steeling her emotions with grace and clarity, she spoke elegantly and briefly. She thanked all for coming. And then she talked of her husband, and the flight of the lost shuttle. "Our mission in space is not over, "she told the hushed audience. "He was the first Israeli in space-- that means there will be more." By Keith Cowing on February 1, 2011 8:31 AM. By Keith Cowing on February 1, 2011 7:01 AM. Twin inukshuks on Devon Island. On the left is the Challenger Inukshuk on the right is the memorial to a member of the Columbia crew. "To honor the memory of the seven astronauts of Space Shuttle Columbia's last flight, and at the suggestion of our colleague Keith Cowing of SpaceRef, the NASA Haughton-Mars Project (HMP) has established seven astronaut memorial sites on Devon Island, in the Canadian High Arctic, during the summer field seasons of 2003 and 2004. Each site was chosen for its special significance in the NASA HMP's analog exploration program near Haughton Crater, and is marked by an Inukshuk, a traditional Inuit "Stone Person". The Inuit erect Inukshuks to mark land and to guide and comfort travelers on perilous journeys across the Arctic." "I asked Joe Amaraulik if anyone had ever figured out how long these structures would last. He said he wasn't sure if they had been dated but that there were some that had been in place for many centuries. As for how long this one, which we had just built, would last, Joe (a man of few, but well-chosen words) said "forever". In other words - the next ice age."